Lisa M. Bernardini | Attorney | Alvarez, Winthrop, Thompson & Storey, P.A. As senior counsel at Alvarez, Winthrop, Thompson & Storey, Lisa Bernardini has more than 25 years experience as a litigator. Ms. Bernardini is a veteran insurance industry lawyer who has worked both in house and in the private sector for various insurance carriers handling first and third party claims, as well as providing coverage opinions.. Ms. Bernardini has extensive experience in managing state insurance defense law firms which specialize in first-party property claims. Moreover, she has vast experience in handling construction defect claims, fraud, and injury cases. 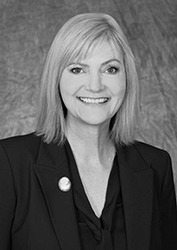 She gleaned prior experience in a statewide law firm where she handled insurance defense and fraud prevention matters and where she handled all aspects of first-party property claims from examinations under oath through the appellate court. As an associate attorney with a Daytona Beach, Florida law firm, Ms. Bernardini handled complex civil litigation; employment discrimination; sovereign immunity; and wrongful death cases. She has over 60 trials in U.S. Tax Courts, as well as felony and civil circuit and county courts. She has worked as a trial attorney representing several major national insurers in complex civil litigation involving commercial claims, premises, property, personal injury, uninsured motorists’ claims, and settlement enforcements. Ms. Bernardini received her Juris Doctor degree from The Catholic University of America, Columbus School of Law, Washington, D.C. in 1989. She received a Master of Laws in Taxation from Georgetown University Law Center, Washington, D.C. in 1991. In 1986, she earned a Bachelor of Arts degree from Manhattanville College, Purchase, New York. In addition to being licensed to practice law in Florida Courts, Ms. Bernardini is admitted to practice in the United States Tax Court and in the U.S. District Courts for the Middle and Southern Districts of Florida.